with fi assumed to lie just outside the +/– 5-kHz channel bandwidth centered on fc. The key to this formula working is the common f0 found in each cosine term. The envelope detector is relatively easy to implement in hardware, but it’s a little difficult to analyze. You can explore the model for R(t) to get a feel for what’s going on. For starters, the input/output relationship is nonlinear, as evidenced by the squares and square root operations. Even with Ai = 0, R(t) contains an absolute value. At this point, assume m(t) = cos(2πfmt) as simple test case. The Python function env_plot(t,Ac,Am,fm,Ai,fi) allows R(t) to be plotted as well as its spectrum. The spectrum PR(f) is a result of using PyLab’s psd() function. Exercise the function by using a time vector running over 20 ms at an effective sampling rate of 500 ksps and then plot time-domain and frequency-domain results side by side (see the 3 x 2 subplot array in the figure). 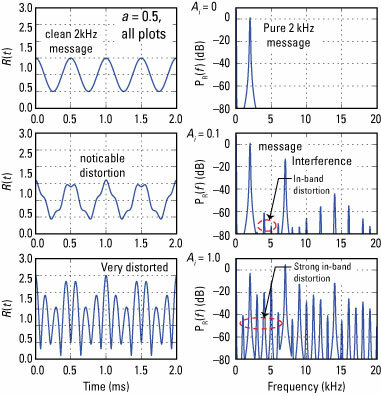 kHz for the interference places it in the adjacent channel (5 kHz is the crossover frequency). The only way to eliminate or reduce the interference is with a BPF in front of the envelope detector. The superheterodyne option is a good choice here, because the BPF doesn’t need to be tunable. At first, you may be disturbed that an out-of-band signal can produce in-band interference, but you should always expect the unexpected from nonlinearities. The upside is that the receiver design is still low cost.